The GhostDrone 2.0 offers different ways to fly compared to the usual radio controlled handset. The VR goggles work well but won't suit everyone. We’ve used quite a few different drones. Typically we’d say that the best way to fly one was with a traditional, radio-controlled handset because using a phone can be incredibly difficult if you’re trying to watch virtual joysticks AND the drone at the same time. However, the Ghost Drone 2.0 flies in the direction you tilt your phone and it works very well. Other built-in flying methods include letting you pick waypoints on a map and following a certain person/object around in various ways. Generally, it all worked very well but we had some issues. Automatic navigating via waypoints has many applications. But it's not easy to adjust height while flying this way. Tap and Go navigation was very simple - but again, the ability to change altitude would be handy. You can get the drone to follow you in various ways. One of which was that before you unlock full controls of the drone, you have to pass some tutorials. This in itself is fine but on a couple of early occasions, situations developed nearby and we had to land immediately... only to be continually told by the drone that we had to complete the tutorial first. We felt a bit like Matt Damon in Interstellar yelling, “Override! Override!” at the device. An emergency override and land button is much needed here. But that’s not really an ongoing issue. One thing we learned from flying is that you need to open Google Maps and zoom in and out of your surrounding area BEFORE you open the eHang app – otherwise your map won’t appear which makes waypoint navigating impossible. Another issue that’s becoming painfully clear is that countries like Australia – and especially New South Wales – are already on a major crackdown on any drone flying in a not dissimilar way to the crackdown on pubs, clubs, cycling and anything else that has a whisker of risk involved. The police are scouring social media for drone videos and hitting people with massive fines for flying in restricted air space – even if they didn’t know. 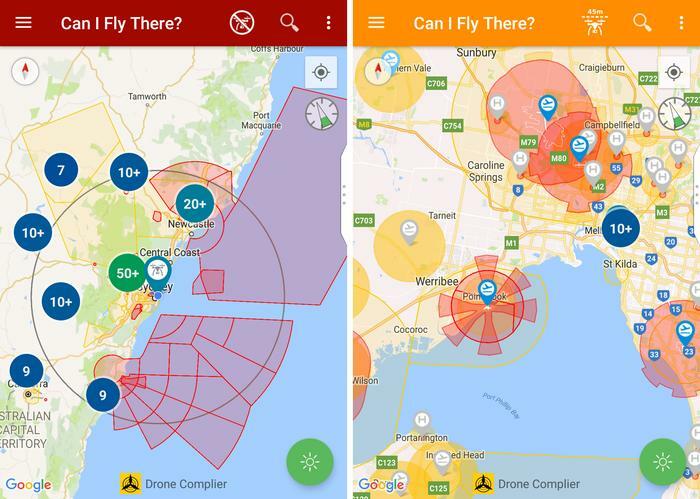 What constitutes restricted airspace these days? Basically everywhere interesting. There’s an app by the Civil Aviation Safety Authority (CASA) which locates you and tells you that you can’t fly there. 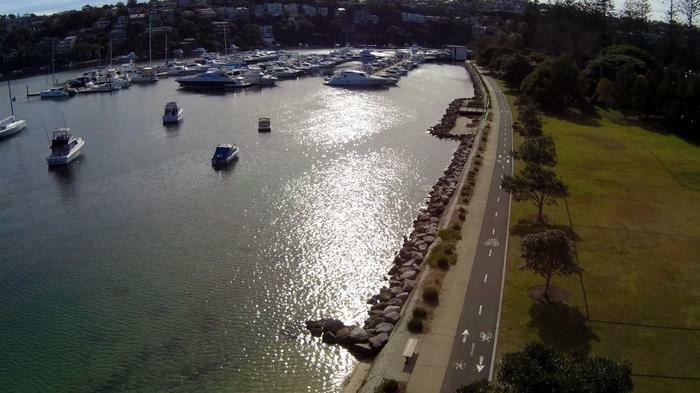 Capture the majesty of Sydney's famous Harbour... and get fined over $1000. Sydney (left) and Melbourne (right). Can you fly there? Even in an empty park? No. Probably not. If you wanted to film your kids’ birthday party? You can’t. 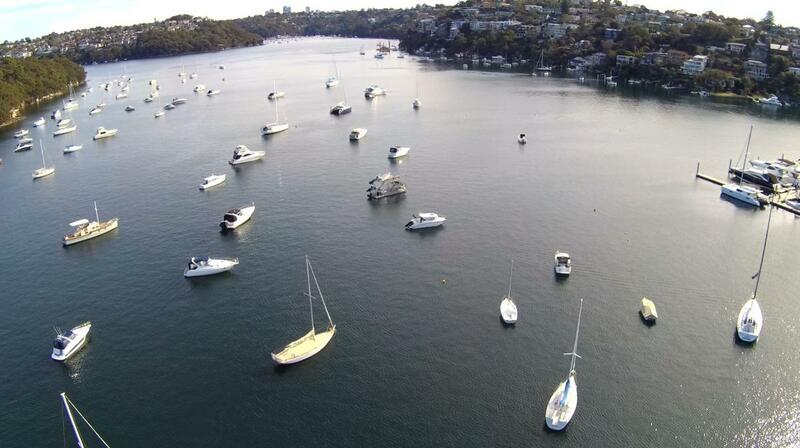 Want to film parts of the amazing Sydney Harbour? You can’t. 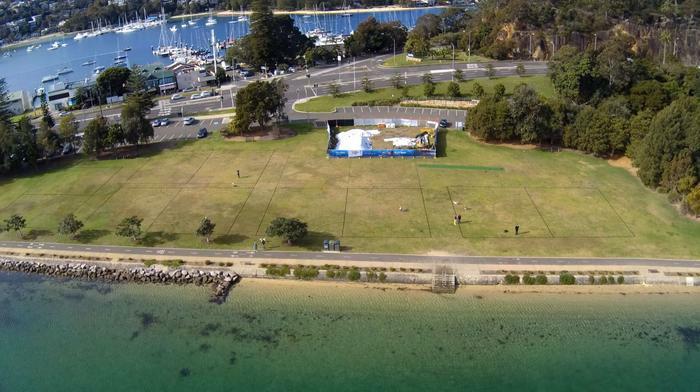 Want to film a park footy match? You can’t. Want to film anywhere in metropolitan Sydney, you almost certainly can’t. Want to fly anywhere near a helicopter pad that might not see any helicopters land for months at a time? You can’t. 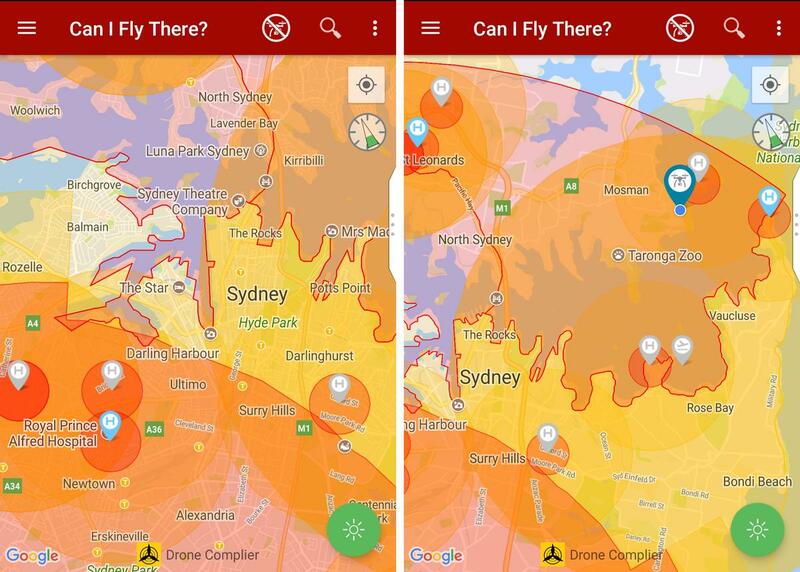 Even if you do find one of the few places that aren’t Verboten, there are now plenty of rules to stop you flying – being 30m near any people is one. Kids involved? Even iffier. It’s not specified whether being there for take-off counts. This all means that once you’ve got your drone you need to be sure you can actually use it, or at least keep using it in the same place without getting bored. However, once you’ve found somewhere to fly you can then make use of the the bundled VR goggles. 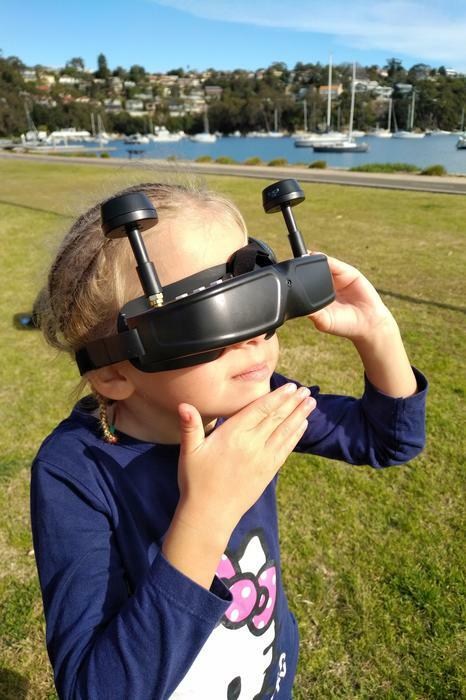 Rather than beam a low-resolution camera image to your phone, you can use the VR goggles to see what the camera sees and move it up and down. If you’re using the phone to navigate with you’ll need to turn that around - not your head. Having someone else look through the goggles and guiding the camera was a the usual order of the day. People loved what they saw - even if it was a remote stretch of water. To be frank, we’re in two minds about this. On the one hand, we often went flying with someone else who wore the Goggles and got the best view. Putting them on ourselves, while flying, isn’t just challenging the line-of-site drone pilot laws they’re not actually that comfortable and you can get quite disoriented. If you’re literally in the middle of nowhere then great but if you’re trying to perform precise flying while looking through the camera, the roughly-half-second delay can get a bit trying. Our main issue with the goggles is that they’re just plain not that comfortable and would get sweaty no matter what the ambient temperature was. From a usability perspective, many of our videos had the camera bobbing up and down because we had them on top of our head and occasionally glanced through them to see where the camera was pointing. It’s our personal preference to be able to move the camera using the same control we’re using for flying as that’s less complicated. We expect others will disagree and that this is exactly what they’ve been looking for. One of the best things about the GhostDrone is the 4K camera quality. We’re often amazed about how these expensive devices can be sold with appalling cameras, but the smooth 4K video on offer here is very impressive, even in challenging lighting. We found video quality was a bit better than stills, though, so we recommend getting screenshots from that. Switching between the two is a bit fiddly anyway. The camera is mounted on a gymbal and is very smooth. Moving your head up and down with the VR goggles moves the camera with less-than-a-second's lag. Our only gripe is that we'd like another way of controlling the camera for when we didn't want to use the googles - even if we could just lock it in place. In good lighting, quality was excellent. There's no sound (it would just be buzzing). Everything is very smooth. Even in very bright lighting, well-exposed images were captured. If you're in and around Sydney, get used to capturing lots of water. There are two smart batteries included which have digital readouts giving you comprehensive charging information. They each take around an hour to charge and last for about 15 minutes. The VR goggles also require charging – via Micro USB. They outlive the batteries many times over and we didn’t have any issues with them running out of power. Ultimately, this is one of the easiest drones to fly but to get the most out of it you also need a lot of practice – mainly to become completely au fait with the VR goggles – something which after a dozen attempts we never really got to grips with. It’s a very different beast to the Xiro Drone Xplorer V which sees a phone clamped onto a standard remote control. Which is better depends on your personal preference. If you want fast and frantic manoeuvrability then the Xiro is more responsive but the controls take longer to master. The avatar mode on offer here is ridiculously simple to master but not as manoeuvrable and the waypoint system is slightly better. If you buy one, note that you have to choose an Android or iOS version - they have incompatible firmware so one app does not work on different drones. However, for what it is, it’s a great buy with some excellent features. At $899 it’s reasonable value and the one-year, ‘You crash it we fix it’ warranty makes it even more compelling.